This book is the result of a conference sponsored by the Educational Testing Service and the University of Wisconsin's National Center for Research in Mathematical Sciences Education. The purpose of the conference was to facilitate the work of a group of scholars whose interests included the assessment of higher-order understandings and processes in foundation-level (pre-high school) mathematics. Discussions focused on such issues as the purposes of assessment, guidelines for producing and scoring "real-life" assessment activities, and the meanings of such terms as "deeper and higher-order understanding," "cognitive objectives," and "authentic mathematical activities." Assessment was viewed as a critical component of complex, dynamic, and continually adapting educational systems. During the time that the chapters in this book were being written, sweeping changes in mathematics education were being initiated in response to powerful recent advances in technology, cognitive psychology, and mathematics, as well as to numerous public demands for educational reform. These changes have already resulted in significant reappraisals of what it means to understand mathematics, of the nature of mathematics teaching and learning, and of the real-life situations in which mathematics is useful. The challenge was to pursue assessment-related initiatives that are systematically valid, in the sense that they work to complement and enhance other improvements in the educational system rather than act as an impediment to badly needed curriculum reforms. To address these issues, most chapters in this book focus on clarifying and articulating the goals of assessment and instruction, and they stress the content of assessment above its mode of delivery. Computer- or portfolio-based assessments are interpreted as means to ends, not as ends in themselves. Assessment is conceived as an ongoing documentation process, seamless with instruction, whose quality hinges upon its ability to provide complete and appropriate information as needed to inform priorities in instructional decision making. This book tackles some of the most complicated issues related to assessment, and it offers fresh perspectives from leaders in the field--with the hope that the ultimate consumer in the instruction/assessment enterprise, the individual student, will reclaim his or her potential for self-directed mathematics learning. Contents: Preface. Part I: Assessment Objectives. R. Lesh, S.J. Lamon, Trends, Goals, and Priorities in Mathematics Assessment. R. Lesh, S.J. Lamon, Assessing Authentic Mathematical Performance. G. Goldin, Toward an Assessment Framework for School Mathematics. D. Chazan, M. Yerushalmy, Research and Classroom Assessment of Students' Verifying, Conjecturing, and Generalizing in Geometry. Part II: New Items and Assessment Procedures. A. Bell, H. Burkhardt, M. Swan, Balanced Assessment of Mathematical Performance. A. Bell, H. Burkhardt, M. Swan, Assessment of Extended Tasks. A. Bell, H. Burkhardt, M. Swan, Moving the System: The Contributions of Assessment. J. de Lange, Assessing Mathematical Skills, Understanding, and Thinking. L. Streefland, Thinking Strategies in Mathematics Instruction: How Is It Possible? Part III: New Perspectives on Classroom-based Assessment. C.A. Maher, R.B. Davis, A. Alston, A Teacher's Struggle to Assess Student Cognitive Growth. H.P. Ginsburg, L.S. Lopez, S. Mukhopadhyay, T. Yamamoto, M. Willis, M.S. Kelly, Assessing Understandings of Arithmetic. Part IV: New Types of Scoring and Reporting. R.J. Mislevy, K. Yamamoto, S. Anacker, Toward a Test Theory for Assessing Student Understanding. S.J. Lamon, R. Lesh, Interpreting Responses to Problems with Several Levels and Types of Correct Answers. R. Lesh, S.J. Lamon, B. Gong, T. Post, Using Learning Progress Maps to Improve Educational Decision Making. Part V: Difficulties, Opportunities, and Future Directions. R. Lesh, S.J. 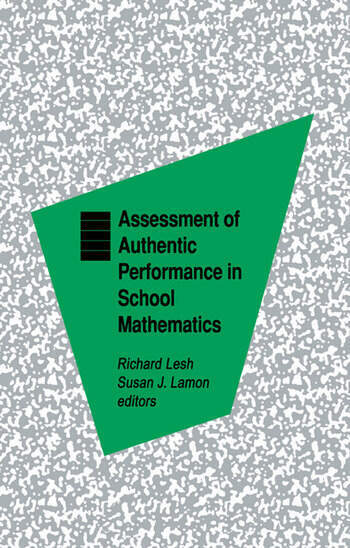 Lamon, F. Lester, M. Behr, Future Directions for Mathematics Assessment. J.L. Schwartz, The Intellectual Prices of Secrecy in Mathematics Assessment.